A new book, Montessori Speaks to Parents by Maria Montessori, was just released this summer, thanks to Carolina Montessori, who is in charge of her great-grandmother’s archives at the Association Montessori Internationale headquarters in Amsterdam. Carolina tackles the more than 56,000 pages of Montessori’s writings, and with her cousin, Alexander Mario Henny, publishes new writings under the Montessori-Pierson Publishing Company. This newest book is a selection of brief articles that Montessori wrote for parents. The foreword is by Paula Polk Lillard, and the photographs are from Forest Bluff School, selected by Lynn Lillard Jessen. The concise language and clear messages in this little book make it a treasure for parents. 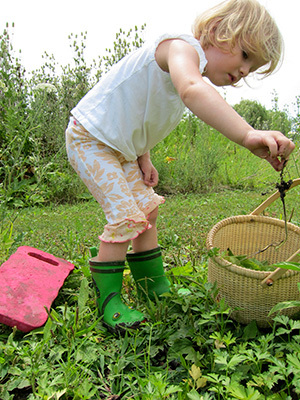 In it, Montessori explains that children’s needs are really quite simple. This means that our role as parents--if we stay focused on the most important aspect of our task--is quite simple. This news is a great relief; our challenge is in changing our mindset to fulfill our simple role! Montessori points out that children learn through movement. Therefore, instead of insisting that children stand still or, conversely, giving them nothing to do but run around aimlessly, we must observe their interests in actions that they fix their attention on, such as fitting a cork in and out of a bottle, a key in and out of a lock, pulling their shoes on and off, or sweeping an area with a little broom. By watching to see what entices them and when they become attentive to something, we can take that as our guide and allow children to work through some actions uninterrupted and unhindered. Montessori explains that we can easily help children to learn by aiding this natural desire for movement: “Our idea is simply to provide [a child] with interesting objects which will nourish and exercise his mind. We have no need to force him to learn, to make him work, he does that of his own accord because it is his nature to grow in mind as well as body” (p. 39). She points out that young children are interested in things that help them to learn about the world, and that if we are sensitive to this, we can have confidence in our children’s choices: “The child’s interest is caught by the objects and activity most suited to his development, and the wise mother will see that her child is kept continually occupied with his own little interests” (p. 37). This is so valuable because this is the way that our children form their intellects: “Children...develop their intelligence through activity” (p. 35). As parents, we can spot when an activity is beneficial because our children will do it again and again, as if trying to perfect their abilities to improve: “…most often a child persists until he himself does it right. This is perseverance which is so important a part of personality” (p. 41). Choosing the daily activities of life as learning opportunities makes a perfect match for young children’s needs and interests; these are the actions we must perform as adults on a daily basis. Rather than rushing through the motions of dressing, eating, and cleaning so that we can get the children out to some event, organized activity, or location, we can slow down and focus on what is right in front of us. The children love to learn to do things for themselves because these actions help them in so many aspects of their development simultaneously: “This is both education and movement, because there is a refinement of musculature coordination when the work is carefully done, and education through movement, because these activities involve judgment and will, self-discipline, and an appreciation of orderliness” (p. 31). Montessori encourages parents to look closely: “Watch him, forget that he is tediously picking up and dropping his rattle--that is your point of view--see him watching his own little fingers, see how he is interested in them. He is developing his muscles. If you watch him closely, you may see perhaps the little fingers open one by one instead of all together…gradually, he is becoming master of his own fingers” (p. 12). We must restrain ourselves at times and allow the children to be free to move with purpose and interact with their environments, only interfering when there is an issue of safety or disrespect. Through their purposeful activity, our young children develop intellect, will, and internal discipline. This happens even when our children seem to be “playing”: “The greater part of what you call ‘play’ is really work. Grown-ups think of play as a purposeless occupation that keeps children happy and out of mischief, but actually when children are left to play by themselves, very little of their activity is purposeless” (p.17). Over and over, Montessori implores us to let the children be – to allow them to do these motions on their own, not to interfere and not to comment or narrate for them. She points out that having too many toys and “a nanny” to watch over their every movement are impediments to our children’s development: “It is tremendously important that we should understand the spontaneous way in which the child develops himself” (p. 12). Of course, our children need to be kept safe and attended to. But ask childcare helpers to stand back or invite your young children to join with daily tasks. Our helpers need to know that we do not want them to interfere or thwart our children’s attempts to do things for themselves--from dressing, eating, washing, and all other daily tasks around the home. Instead, we want them to slowly show our children how to do things for themselves and show them how to help us with daily tasks. Not To Always Have His Own Way! Montessori cautions, “Do not think for a moment that I maintain that a child should always have his own way. That is not what I mean when I say it is wrong to thwart children. But there are two ways of trying to teach obedience. In the misguided old way children are simply told to do this and that, and that is all there is to it; they are punished if they are disobedient. Then there is the other way on which my entire system is founded. Ask from your child only what he can give you; that is, ask for obedience in such a way that your child will be glad to give it, and he will learn the habit of obedience easily because he has learnt it naturally” (p. 29-30). What Montessori means here is to align your goals with those of your child, who is driven by an inner urge to move, to perfect his movements, and to interact with the environment around him. Children are driven to line up objects, to stack them on each other to build a tower, to arrange things, to scrub and wipe things, to open and close, to put things in and out of other objects. 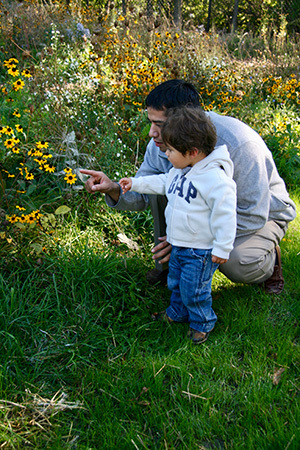 In all these motions, your young children are discovering the world around them, perfecting their own abilities to affect the environment, and developing their intelligence. They are exploring and forming their knowledge of gravity, physics, size, shape, texture, and so on. And during these interactions with the real world, there is no teacher, yet your children are learning! Ultimately, we must understand that adults act to change the environment and to use as little effort as necessary. We have created vacuum cleaners and other machines to help us to be more efficient and effective. (I put computers and smart phones in this category.) But the child is at work to build himself as a human being, and he needs to function at his fullest capacity to delve into the details of tasks and to exercise his maximum effort. He tries to work all the time by being active. Our job as adults is to allow him to do this imperative work. The outcome will be the some of the characteristics we’d like to see all children develop: persistence, resilience, problem solving abilities, collaboration, motor control, self-discipline and restraint, creativity and imagination. So, instead of thwarting your children’s desires to be active by trying to force them to be still or implanting a diversion that is not in sync with their developmental needs (such as a screen or machine), invite them to purposeful activity and step aside when they fix their attention on something that feeds this inner drive. Attention leads to concentration, and ultimately to the development of character. Ironically, the end result is a happy little person who is ready and willing to sit patiently because their need to move with purpose has been satisfied. I hope Forest Bluff parents will join Nalisa Ward next week to discuss this wonderful little book and explore how the messages in it can inspire our parenting! The book discussions will be held at Forest Bluff School on Friday, October 6th at 8:45 a.m. and at Nalisa’s house on Tuesday, October 10th at 7:00 p.m. Please RSVP. You can purchase a copy of Montessori Speaks to Parents at our school office. In other communities, I urge you to do the same, and invite some Montessori-trained teachers to join you and explain some of Montessori’s comments in a context that helps you to bring these gifts to life in your own homes!